Opening reception: Thurs., June 14, 6-9 p.m.
More than just a fascination with the prairie, artist Regan Golden takes these plants’ lives seriously. The artist collects more than 140 images documenting the lifecycle of plants from Minneapolis’ edgelands, a transitional space found on a town’s boundaries which are generally absent in city maps. Her images bring visibility to this much-overlooked landscape. Hours: Tues.-Fri. 1-6 p.m., Sat. 11 a.m. – 4 p.m. Opening reception: Sat., June 16, 3-6 p.m.
Fri., June 15 5-9 p.m. and Sat., June 16 11 a.m. – 5 p.m. The popular summer arts market returns with vendors selling everything from tarot readings to custom tintypes, artwork, ceramics, clothing and other homegoods. This year’s both evenings vendors include Zoey Melf, Casey Deming, Noah LH, Fiona Avocado, Arcana Leatherworks, There There Collective, Ann Erickson, Wacks Co., Amanda Dobbratz, Daniel Jaffe, Linda Moncada, Rebecca Spangenthal, Discounted Future, Heather MacKenzie, and Alex Micallef. Friday-only vendors will be Collecting Dust, Hand Bound, Hey Ok Good Goodies, Nicole Mayefske AKA Big Mouth Tarot. Saturday-only vendors are ROMI Apothecary, and Mystery Spot Books. When: 9:02 p.m.-2 a.m. Fri.-Sat. Where: Downtown Mpls., at the Commons park (next to U.S. Bank Stadium), Nicollet Mall between 3rd and 8th Sts. and Minneapolis Central Library. Ride pass: Download a free pass for Metro Transit trains and buses each night. Northern Spark is like those former college all-night ragers who now need their eight hours of ZZZ's. 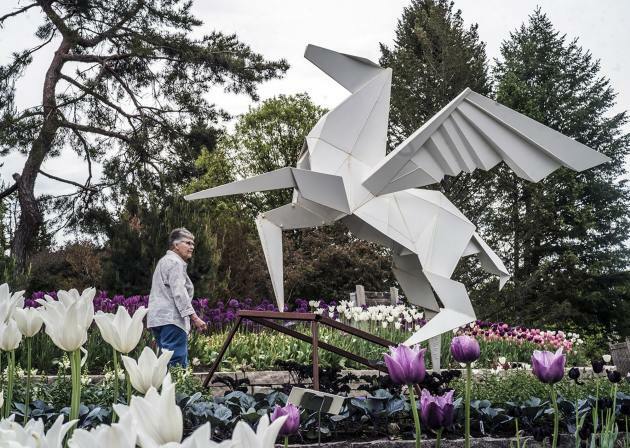 After seven years as a single-night, sunset-to-sunrise outdoor arts festival, Spark is splitting its schedule over two evenings, from 9 p.m. to 2 a.m. Friday and Saturday. The thrill of staying up all night will be lost, but more sleep could mean more fun. "Two nights is an experiment," said publicist Amy Danielson. "It's just quite unpredictable to plan one night, not knowing what would happen with the weather." Northern Spark devotees will remember 2014, the year of torrential downpours. Last year, a big storm came through as artists were beginning to tear down their projects — a near-miss. Weather this year appears to be clear skies, but given this week's on-again, off-again rain, anything could happen. 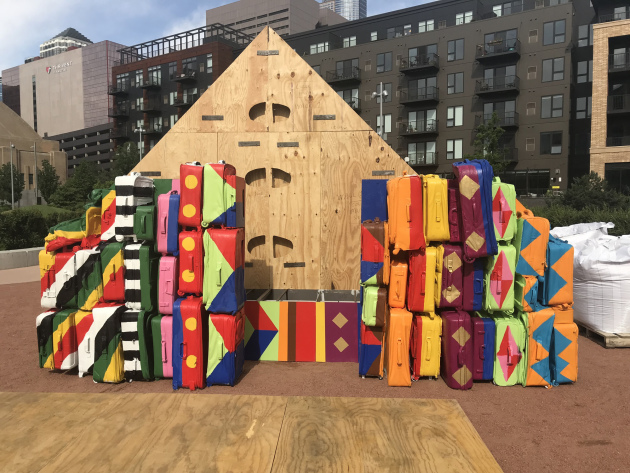 Such is the experimental nature of the program, taking place this year in downtown Minneapolis at the Nicollet Mall, Minneapolis Central Library and the Commons park next to U.S. Bank Stadium. The latter location helped inspire this year's theme, "Commonality." A total of 28 artists received stipends ranging from $1,500 to $6,000 for projects responding to the stormy cultural and political landscape and trying to raise awareness, both societally and interpersonally. Above: Stone Arch Bridge Art Fair, 2017. Photo by Jenna Klein. Sat., June 16, 10 a.m. - 7 p.m. Sun., June 17, 10 a.m. - 5 p.m.
Art, music and vintage cars flood the riverfront for this weekend fair. Ceramicists, craftspeople, painters, glass artists, jewelrists, sculptors, photographers, printmakers and even students will be selling their art ands and crafts. Catch a variety of musical acts, including MN Sinfonia, Rogue Valley and Murzik. If your true love is the classic vintage care, stop by the Art of the Car show, where well preservered hotrods and convertibles transport you to a different time. There's plenty to eat, too, courtesy of the culinary artists.